The cat was nowhere to be seen. But Celeste did spot something that caused her to reach for her rolling pin. There, stuck like a lump, in her dough was the fly—a very large fly. 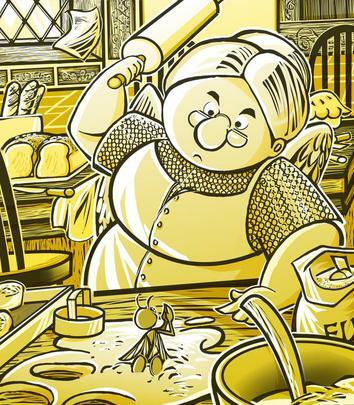 The angel's first impulse was to hammer the filthy nuisance with her rolling pin. “Good Heavens!” Celeste put down the rolling pin, cleaned the flour from her eyeglasses, and bent down to have a closer look. “Don't hurt me . . .I won't pester you,” pleaded the fly offering up a fragile smile as proof. “Of course I won't hurt you . . .” said Celeste, smiling right back, “. . . provided we can get you out of my cookie dough. And out of my cat's reach long enough to explain how I've gone from talking to myself, to talking with a great big fly. “I'm not a fly,” said the fly. "I'm actually a prince—and heir to the throne . . . and I'm cursed." After spilling out the gist of it, the fly hesitated to await Celeste's reaction. “Very well,” he said. After taking a moment to collect himself, the words came tumbling out. "Some months back I crossed swords with a practitioner of the black arts. A wretched sport, I daresay . . . tightly wound and ready to snap. This twisted fellow was spurned by one of the king's royal courtesans whom he favored. Disgruntled by the rebuff, he absconded with the poor damsel, intent on turning her to stone, or sending her to the nether reaches with a spell. As it happened, I stepped forward on her behalf. I rankled the old warlock unceasingly, until . . . well as you see, it was me he sent instead.